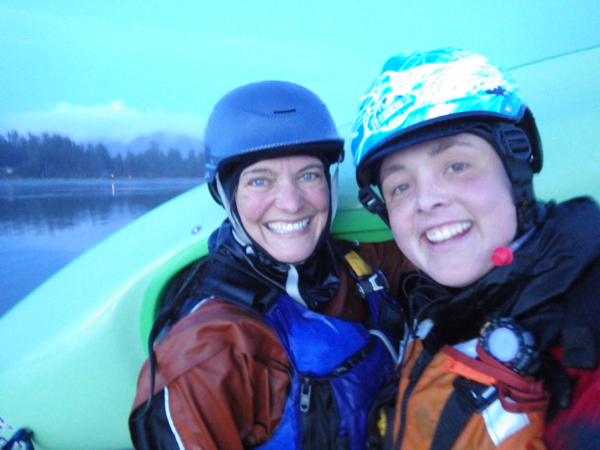 It is just eight weeks until Justine and I fly to Alaska ready for the start of the Aleutians kayaking leg. Gulp. It’s an excited gulp mind you, and one that comes with a huge grin at the moment and a satisfied sigh, too. For it is only in these last couple of weeks that I have finally felt confident that I shall be healthy enough to shred some serious daily mileages in a kayak for a few months in the challenging conditions of the Bering Sea. The pneumonia back in October and allergic efforts by my body to thwart plans challenged me right through the autumn and winter. I now feel back on track physically and more like a Tigger than I have for months. The allergies are still there but they are manageable and my immune system finally seems to be doing useful things which is pleasing. My recent two-week trip to the US and Canada was a great test of stamina and my immune system’s ability to cope with travel and hoards of people. 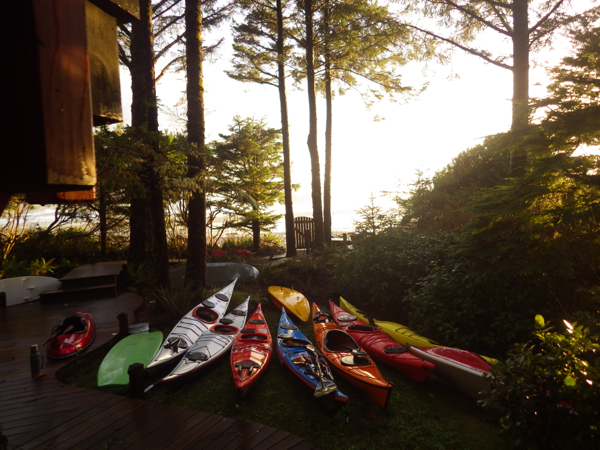 It was also a great chance to connect up with sponsors and friends, meet interesting people, finally meet Canada and also get in some useful kayak training in one of my now favourite places in the world – the west coast of Vancouver Island. Having never been especially happy about being upside down in boats or in surf since crash-landing onto the reef in Mauritius at the end of my Indian Ocean row in 2009, a thrashing in the waves in my kayak back in January really knocked my confidence. It was starting to wind Chimpy up into a bit of a frenzy about the challenge of the Aleutians and all the potential surf landings ahead. Before heading out I was a bit daunted by Tofino and the reputation of the Pacific rollers roaring in across the bay. When we arrived on that rugged forested coast and saw and heard and felt the waves I was daunted some more. It was impressive to look at and I knew it was fun to slide along waves onto the beach and pick my way in and out of the surf; I just had to get Chimpy in on it. I’m happy to report that after a tentative first couple of days Chimpy and I loved it, especially after getting our hands on the sit-on-top kayak. Having nailed lots of useful hours in the waves, improving skills, pushing boundaries and letting Chimpy see that all is OK, I am really looking forwards to the Aleutians and happy to have made good progress in the surf. That’s a relief all round, for I find there’s nothing like a chattering Chimpy to hold you back from performing well in challenging situations. Time together on the west coast also provided Justine and I with a chance to chat about plans for the journey ahead, make lists and more lists of kit still left to order and the logistics of food resupplies. Since coming home I have picked this up and also started to look at onwards phases of biking and rowing too, which feels a bit surreal and mind-bogling at times. Pulling off a big expedition like L2L with all these linked phases makes for a huge mission across the board – logistically, financially, emotionally, physically. For a while lately it had all felt a bit much and I questioned whether it was all worth it. A run on the beach and some time sitting watching the waves and letting them become me, helped me find peace and remind me that the challenges of late and the painful thought of leaving my fiancee Lucy again are just hurdles to find a way round, not reasons to call it a day. P.P.S Thursday March 27th, Stamford Arts Centre – Join me for my talk *Pacific 2.0* Tickets here. 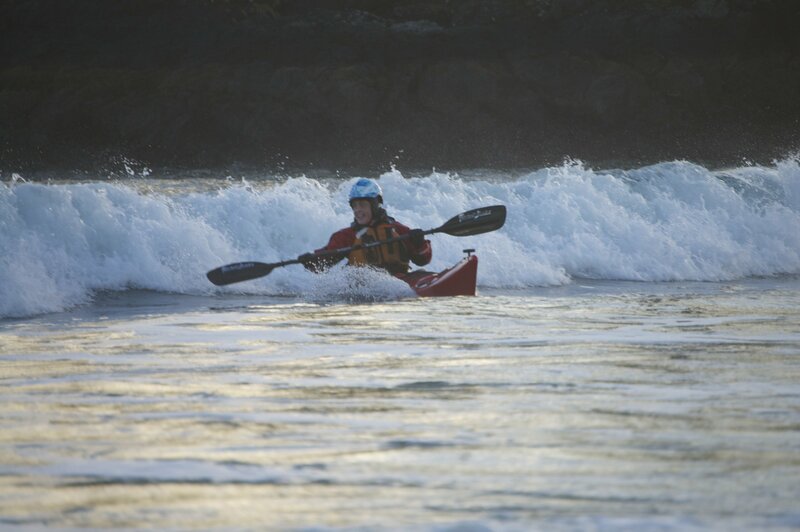 P.P.S I look forward to introducing you soon to the new 3-piece Rockpool kayak who will be my boat for the Aleutians. She is nearly ready and very sparkly. Great to have power traveller on board for the solar chargers. And you really did get a machete! Glad to hear the spirits are high and the excitement is building. Best wishes to all you travelers as you return to Alaska for continuing your journey. Looking forward to your landing in Homer!! I haven’t heard from you for a while, it’s good to hear that you’re working on building yourself up. you are a true inspiration thank you! Good on you both. I know you will have a great time. And surely Tigger will bounce Chimpy into submission! Great news – sounds like you and Chimpy and your body are working as one. Exciting times ahead! Good to hear the latest on your plans and more to teh fact taht you are feeling better and stronger as the days go by. A great blog and some lovely pictures. You know we are all behind you and will be when you set off, over 1/2 way to completing your dream, the admiration that we have for you. We couldn;t do it but we can support you. Take care and enjoy the time before you set off again. Love to your Mum and hope she has had a wonderful time. Great to hear from you…do I recognise that misty shot? 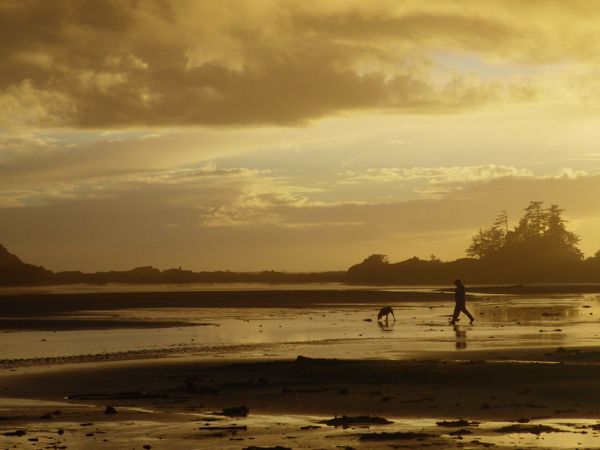 Is that Chesterman beach? We were actually in Tofino when you and I first met on the internet! 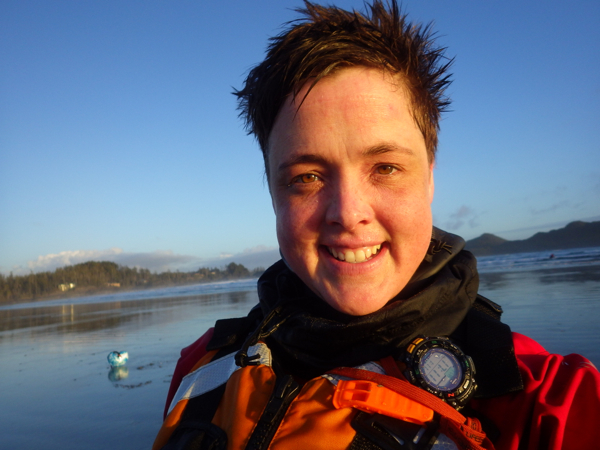 now my cousin Josie Osborne is the mayor of Tofino…so if you land on that beach I’m sure she will give you a big warm Tofino welcome. Lots of love, looking good, glad chimpy is behaving ! So good to see you smiling. Please to draw yourself up to full height, puff out your chest and say to Chimpy (recalling the general demeanor of Lady Bracknell when discussing handbags), I am SARAH OUTEN! I am a VERY COMPETENT PERSON! And when you and Chimpy have giggled and the balloon of pomposity has shriveled, you can tell Chimpy, firmly, that you have rowed across two rather large oceans, paddled across the English Channel and the sea to Sakalahin Island – and that you’ve done rather a lot of bicycling. All this adds up to a rather good track record and lots of experience. Therefore, Chimpy – get set to enjoy the next phase! What a great post and image. Lady Bracknell indeed! Thanks Anna. Happy to hear from you. 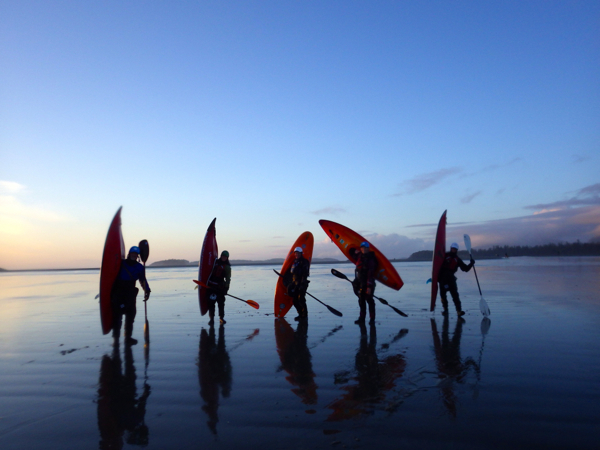 Only 2 months left for your paddling to the sea, You should take care of yourselves !! Thankyou Team Choshi! It seems strange to think it was a whole year ago since Happy Socks and I were in Japan. I hope you are well Kay. Please pass my best wishes to Kaz too.